Two political parties, the first old and established and the second absolutely brand new, are striving for victory as Israel’s general election draws closer. Prime Minister Benjamin Netanyahu, the leader of the right-wing Likud Party, faces a stiff challenge from Benny Gantz, the head of the newly-formed centrist Blue and White Party and the former chief of staff of the Israeli armed forces. With Israelis going to the polls on April 9, Netanyahu and Gantz are running neck-and-neck. Gantz, claiming that Israel has “lost its way” during Netanyahu’s 10-year term of office, is promising voters a sharp break with the Netanyahu era. Yet even a cursory examination of his views and his platform reveals an uncomfortable truth: he and Netanyahu are more or less on the same page as far as key security issues are concerned. Netanyahu, who grudgingly endorsed a two-state solution shortly after his reelection in 2009, has since backtracked. What he currently offers the Palestinians is autonomy, with Israel being in charge of security in the West Bank, particularly in the Jordan Valley. During the past few days, emboldened by U.S. President Donald Trump’s recognition of Israeli sovereignty over the Golan Heights, Netanyahu has reiterated that Israel will maintain control of the West Bank, or at least considerable parts of it, rather than cede it to the Palestinian Authority. Gantz, who was chief of staff from 2011 to 2015, threw his hat into the ring when he created the Israel Reliance Party. Two months ago, he joined forces with Moshe Ya’alon of the Telem Party. Ya’alon, the former chief of staff, was defence minister in Netanyahu’s coalition government from 2013 to 2016. On February 21, Gantz and Ya’alon merged their respective parties with Yair Lapid’s centrist Yesh Atid Party. Lapid was Netanyahu’s finance minister from 2013 to 2014. 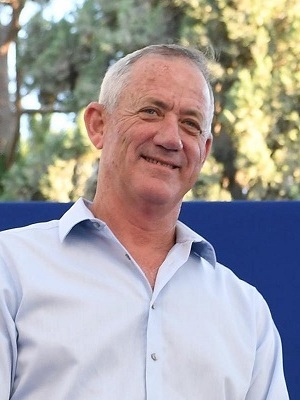 Following the merger, Gabi Ashkenazi, Gantz’s predecessor as chief of staff, joined the Blue and White Party. 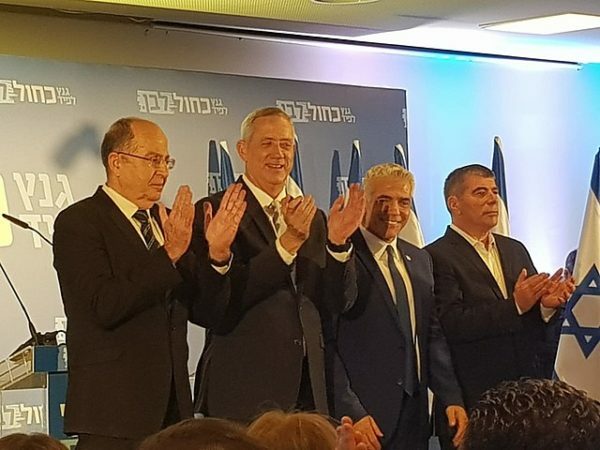 Under their agreement, Gantz and Lapid will take turns as prime minister and foreign minister should the Blue and White Party form the next government. Before the grand merger with Yesh Atid took place, Gantz was vague about the future status of the occupied territories and the Palestinian issue. Gantz’s cautious approach is less than surprising, given the hardline composition of his leadership team. Apart from Ya’alon — a former member of the Likud Party who has ruled out a two-state solution — the members of his inner circle include Zvi Hauser, Netanyahu’s former cabinet secretary, and Yoaz Hendel, his former spokesman. Both Hauser and Hendel lean to the right. 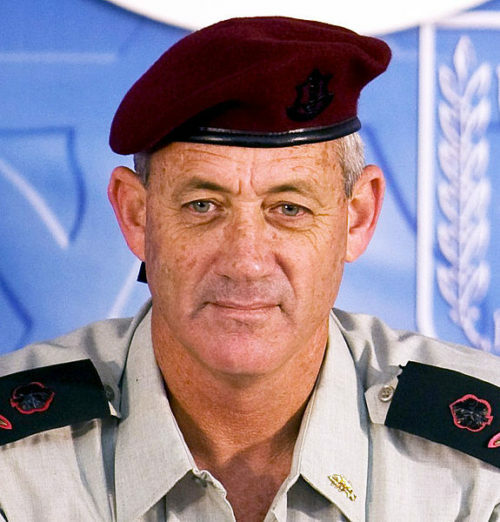 Prior to the merger with Yesh Atid, Gantz declined to publish his views on current security and diplomatic issues. But on March 6, less than two weeks after joining forces with Lapid, the Blue and White Party released its long-awaited platform in a 48-page manifesto. Endorsing Israel’s 1967 annexation of East Jerusalem, the party supports a “united” Jerusalem as Israel’s capital, the retention of settlement blocs in the West Bank, a continued Israeli military presence in the Jordan Valley, and a willingness to embark on peace negotiations with the Palestinian Authority. The Blue and White Party promises “separation” from the Palestinians while maintaining Israel’s “security interests” and the Israeli army’s “freedom of action everywhere.” But in a highly significant omission, the concept of Palestinian statehood goes unmentioned. A day after the platform was released, one of its authors, Yesh Atid parliamentarian Ofer Shelah, said that Israel’s separation from the Palestinians would inevitably result in the establishment of a Palestinian state in much of the West Bank. “There is no other way to bring about the separation from the Palestinians,” he noted. In its platform, the Blue and White Party describes the Golan as an “inseparable” part of Israel, and rejects as “non-negotiable” the notion of returning the strategic plateau to Syria. Gantz and Netanyahu also share an identical view on Iran, Israel’s foremost enemy. Gantz, who was chief of staff during the 2014 Gaza war, has criticized Netanyahu’s measured policy on Gaza from a right-wing perspective, saying he would adopt a tougher approach toward Hamas, which has launched thousands of rockets and mortars at Israel since 2001. When he led the Israel Resilience Party, Gantz released videos bragging he would, if necessary, bombard segments of Gaza “back to the Stone Age.” Another campaign video lauded Israel’s assassination of Ahmed Jabari, the head of Hamas’ military wing, during the opening phase of the second Gaza war in 2012. Netanyahu, fearing that Gantz’s stellar military credentials may well swing the election in his favor, has poured scorn on him. Shortly after Gantz and Ya’alon amalgamated their parties with Yesh Atid to create the Blue and White Party, Netanyahu warned they would court anti-Zionist Arab parties to tip the balance of power against him and would tolerate the establishment of a Palestinian state, which, he believes, would imperil Israel’s existence. Refuting Netanyahu’s accusation, Gantz has said he would form a coalition government only with Jewish and Zionist parties. In desperation, Netanyahu’s campaign ads have also portrayed Gantz as a mentally unstable person who sought psychiatric treatment and whose cell phone was hacked by Iran. Gantz has denied both allegations, ascribing them to Likud’s “dirty tricks” department. Politics is politics, of course. But at the end of the day, Gantz and Netanyahu concur on the most vital national security issues confronting Israel today.